As some of you might know I got a LOT of nail polish for my birthday and I wanted to show them to you. 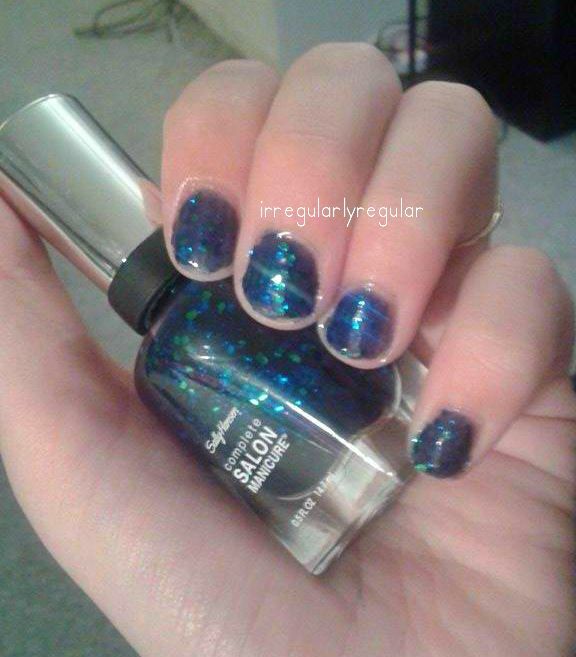 The first one I tried out was Sally Hansen – Mermaid’s Tale. It was a little hard to apply because it was hard to get an even amount of glitter all over the nail. But boy was it worth it! It looks so pretty – my photos didn’t capture it very well, my camera is acting really weird right now and won’t focus at the moment, but you can look up swatches on google and see for yourself. And when they call it a “complete salon manicure”, they are right. I applied base coat – it said that you didn’t have to because it was already implemented in the polish, but I did anyway because it is a glitter and I feared having to take it off without base coat. I applied two coats and was satisfied – you might want to apply three if you want it a bit darker and opaque. I didn’t even bother to apply a top coat because the finish is very smooth and shiny – might as well save some top coat! We’ll see how fast it chips without, but so far there’s no problem. I really like this and if all of their other polishes in the brand are as good, then I’m definitely buying more! Good thing I have another once to try out as well.